Tiny houses range in size from 250 to 400 square feet. There are also micro houses in the 75-250 square foot range. For someone who’s never lived in a tiny or micro house, apartment, or bedroom, this amount of square footage would probably seem unlivable to you. It may feel like that at first, but you quickly adapt. The low rent is what attracted me to the apartment. Privacy is what attracted me to my tiny bedroom. In both cases, I found that I easily adapted to these tiny spaces. I learned to be more efficient and creative in the way I organized my possessions. I also discovered that living with less stuff made my life easier. Then after a short time, I found myself enjoying these tiny living quarters. When you’re doing an activity like sitting in front of your computer like you’re probably doing right now as you read this article, the amount of space you’re using is very small. And when your attention is completely focused on your computer screen and the words in this article, the square footage of the space you’re in is inconsequential. Same thing happens when you’re living in a tiny space. After a while, you don’t think about its smallness when you’re surfing the Internet, reading a book, eating a veggie burger, or watching TV. Having said all that, I should tell you that at this point in my life I would favor living in a small house (400-1,000 sq. ft.) over a tiny house. But I still prefer to have everything else tiny including my car. My next car purchase will be a microcar. I still think tiny houses are charming though. Some of the brilliant exterior and interior designs that people have come up with are amazing. One of those brilliant designers is Jay Shafer. He is the founder of Tumbleweed and, more recently, Four Lights tiny house companies and is considered to be one the early pioneers in the tiny house movement. 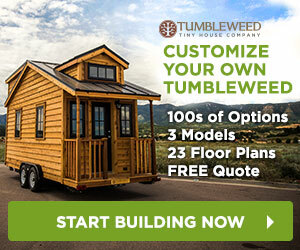 Tumbleweed, which Shafer left to his business partner, designs and builds micro and tiny houses. Shafer also conducts workshops on how to build micro and tiny houses across the US. Tumbleweed does workshops as well. Shafer’s company grew out of an 89 square foot micro house that he built for himself. After family and friends saw his micro house, some of them wanted one for themselves. So a new business was born. Shafer’s own micro house was featured on Oprah some years ago. I found that pretty interesting since you could fit 258 copies of Schafer’s micro house inside of Oprah’s 23,000 square foot mega mansion in Montecito, California. HGTV’s “Design Star” had a micro house challenge in September of 2011. The competition began with three identical Tumbleweed micro houses. These designers demonstrated that you can do many incredible things with these micro houses. There’s one thing that you can only do with a micro house and that is to build them on a trailer. Schafer’s own micro house is built on a trailer. Several of his micro house designs can be built on a trailer as well. There are several advantages to having your micro house on a trailer. The first is obvious. It’s mobile. Mobility can be a huge advantage if you have noisy neighbors, controlling relatives, or you just want to move to a cooler or warmer climate. The most significant advantage is that a micro house on a trailer can often get around city ordinances that require a house to have a specific number square feet. This issue can be a challenge for micro and tiny house builders, so be sure to check with your city’s building department before buying plans and especially supplies. A tiny or micro house can create huge changes in your life. And they can instantly launch you into the tiny lifestyle big time!